So this time I have another handy function for interacting with Salesforce from Coldfusion. If you don’t know, I’m a huge fan of working with the Salesforce API with Coldfusion using the library by Tom De Manicor http://www.escapekeys.com/blog/index.cfm/. I’ve been using it so much, and so heavily that here and there I make some small add ons and other neat stuff. This function in particular is one I really like. 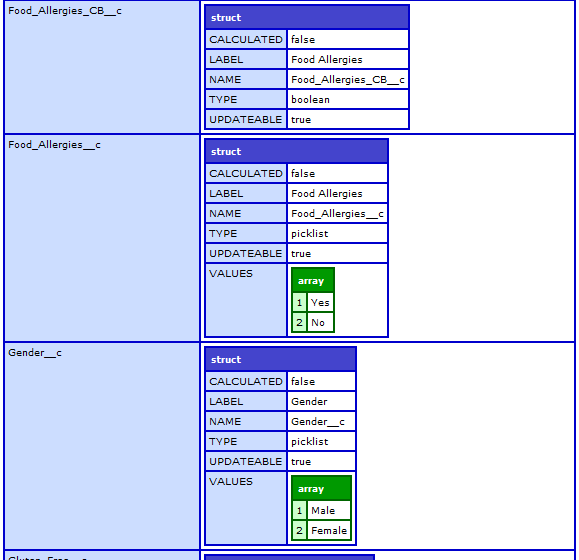 It allows you to describe an sObject and store all data about the fields in an easy to reference object. So say on your ColdFusion powered website you want to make a picklist with the same values as a picklist in Salesforce, and not have to hard code them, you can describe the sObject, find the fieldname key, and iterate over the values to build your picklist. Of course describe sObject is kind of an expensive call, so I’d recommend caching the results in application or server scope. I generally do this when my application starts and have a manual refresh when needed (how often does the schema of your object change, honestly?). Here is the function. Now if you dump out of the contents of server.SalesforceFields.contact you’ll get something that looks like. Just another quick handy ColdFusion function here. This one will allow you to take a fifteen char Salesforce ID, and expand it into an eighteen character one. This is useful since if you want to store Salesforce Ids in ColdFusion, you’ll want a none case sensitive version, which is what the 18 character long one is good for. The 15 char one is case sensitive, while the 18 char one is not. So I always work with the 18 char one, since it’s easier. Due to some recent financial challenges, I have decided to throw my hat in the ring as a freelance developer. Simple flat rates, and no BS. I won’t take jobs I don’t think I can do, and I work fast. Below are the rates (may be negotiable). Right now I’m looking for mostly simple projects, not more than maybe 10 hours at a throw, but I’m certainly open to talking about other opportunities. If you think you have some work for me, visit my contact page for info about how to get a hold of me. Thanks! so even after sending that structure through serializeJson the case of key name in the second example is preserved. Hope this helps someone, cause I know it was driving me crazy for a while! I’ve been doing some work with phone systems that read text. One issue I hit is that they tend to want to read numbers as…. well numbers. For example an address like 2324 nowhwere street would come out sounding like ‘two thousand twenty-four nowhere street’. While correct, it’s not exactly what a caller wants to hear. So I threw together this quick function that will take a string and convert any numbers into their word equivalent. Hope this helps someone out there.